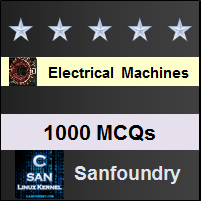 This set of Electrical Machines Multiple Choice Questions & Answers (MCQs) focuses on “Torque in DC Machines”. 1. Choose the correct representation, which depict a non-zero torque in the armature. Explanation: Torque is produced when the net force is zero and there is a couple generated. The directions must obey Lorentz’s law and vector product. 2. What is the principle of torque production in a dc machine? Explanation: Though all the mentioned laws contribute towards the torque generation, but primarily its the Lorentz’s forces which initiate and define the torque direction. Explanation: The magnetic field vanishes at the pole terminals and thus the cross product with the magnetic field yields zero. 4. The simple rotating loop between pole faces connected to a battery and resistor through a switch, the specifications of this machine are radius = 0.5m, length 1m, resistance = 0.3 ohms and magnitude strength = 0.25T is supplied with 120V. 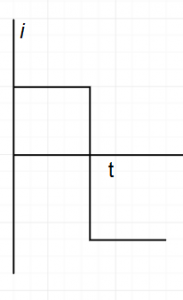 Suddenly the switch is closed at t=0, what is observed in the circuit? Explanation: Initially the induced emf in the armature is zero. But the current will flow as there is terminal source voltage. 5. The simple rotating loop between pole faces connected to a battery and resistor through a switch, the specifications of this machine are radius = 0.5m, length 1m, resistance = 0.3 ohms and magnitude strength = 0.25T is supplied with 120V. 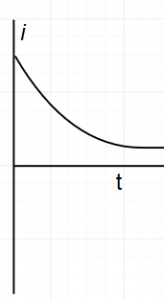 What will be the magnitude of the following current at t=0+? Explanation: The torque at steady state of operation is zero as the emf induced is equal to the source voltage. Also the the very much starting the current will be zero which will not let the emf to get induced. 7. The simple rotating loop between pole faces connected to a battery and resistor through a switch, the specifications of this machine are radius = 0.5m, length 1m, resistance = 0.3 ohms and magnitude strength = 0.25T is supplied with 120V. What is the steady state angular velocity at no-load? Explanation: The electromagnetic torque generated in the dc generator is in the direction in which the prime mover is rotated.It is produced due to the action of armature current and stator field. Explanation: It is due to the fact that no field poles are induced in PMDC to create magnetic flux leading to harmonics. Explanation: The torque will indeed depend on the geometry as well the magnetic materials used in the construction of the dc machine. Though this remains constant with the machine. 11. For a universal motor, the rated supply current is 10A giving a rated torque of 100 N-m. If a current of 5A is applied, what will be generated torque vary to? Explanation: The torque is proportional to the square of the current. So the new torque will be 100*(2^2)= 400 N-m. Explanation: The torque reverses its direction in the negative cycle of the ac supply and thus it always unidirectional. 13. 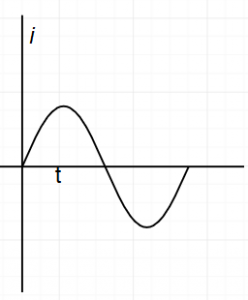 The variation of current in the armature can be best expressed by which of the below curves? Explanation: The emf induced is initially zero which causes a high current in the begining and slowly as the emf is build up, the current reduces to zero at steady state. Explanation: The velocity at steady state is E/Bl.